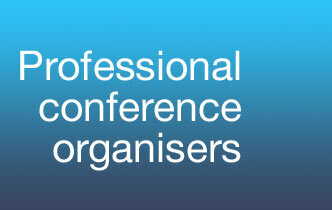 So many hours spent organising a conference; all that hard work deserves to reach a maximum audience. That’s where effective marketing becomes essential. Meeting Makers is here to offer expert guidance: what to do and when to do it. We are also here to be hands-on, creating professional marketing tools and putting them into action on your behalf. A dedicated website for your event, set up quickly to capture and keep early interest. This would initially be a holding page where people can submit their details to receive all the news, seamlessly developing as the conference organisation progresses, into a comprehensive online guide that will also allow online registration and submission of abstracts. With a trusted network of contacts, we can offer cost effective graphic design and print to promote the conference beforehand or record its achievements afterwards, as in the production of a Conference Programme and Book of Abstracts. This could include delegate packs created in the consistent graphic style of the conference, to be handed out at registration, including material from speakers and sponsors. Meeting Makers has invested in the latest emailing software to create, schedule and send personalised emails to cover all the key stages of the event, reporting back to you on how many emailers were opened and how many led to your website being visited. Emailers can be sent to your database of potential delegates, or the growing database of delegates who have registered interest with you online. Fast and effective, emailers are the perfect tool for a ‘green’ conference as they don’t create any waste, and we always send ours with the facility to unsubscribe. We can set up social media profiles, such as Facebook and Twitter, and offer guidance on how best to use this new media to generate interest and share your news online. We can assist with all traditional press relations work, including news releases to all your key journals well in advance of the event. We can also invite the key press to attend your event, providing them with a pressroom and press packs. For big announcements, we can orchestrate press conferences and one-to-one interviews. This includes organising any photography required for the press to use. If you already have a tried and trusted marketing team, in-house or in an agency, we will be delighted to work with them, combining their skills with our specialist knowledge. If you want to talk in detail about how we can help with the marketing of your conference or event, call us now on +44(0) 141 945 6880 or email Meeting Makers here, and we’ll call you.